For starters, if you don't know what a Leslie Speaker is, click here, then come back. 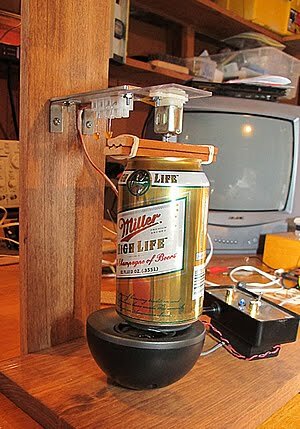 Over at Beavis Audio Research (one of my favorite places for circuits, effects, amps, oscillators, and sonic glee and madness) he has tried to build a rotating speaker using a beer can. Why would one try to do this? I'm not going to comment on that because I do dumb crap too, all the time, in the name of science...otherwise known as just killing time and keeping my brain out of trouble. Just when I wondered if the world needed yet another Arduino clone, along comes one that I actually need. It comes unsoldered, which is great for end use versatility. It has the usual Arduino connector footprint so will work with shields. It doesn't have USB on board which saves money and height. It's red and has flames (of course that's a selling point for me - YMMV) All that for $13! This is pretty sweet. 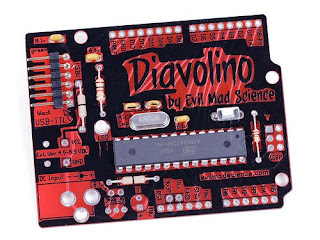 "Diavolino ("little devil") is a low-cost, easy to build Arduino-compatible development board. It's a low-profile through-hole version, with a simplified design. It's based on a ATmega328P microcontroller, and comes pre-flashed with the Arduino bootloader. Open source design, with bare basics hardware." Go buy one by clicking here.